It doesn’t take long before Portugal’s lifestyle and pace influences visitors, and after a few short hours new arrivals may suddenly feel a profound sense of relaxation. Despite many landmarks, it is easy to move slower and enjoy each new experience at a deeper level. Portuguese culture, although rich, is also one that appreciates a simpler side of life, and newcomers are quick to follow suit. Ten minutes late is on time. Unlike some communities that are rigid about punctuality, the Portuguese take on a near laissez-faire attitude. It’s not that they don’t care about time, but the world won’t end if someone is ten minutes late, especially in social settings, and locals tend to reach their destinations calmly rather than in a rush. All along Portugal are charming coastal towns and villages that are home to beautiful beaches. During the summer months, these spots become inundated with tourists and locals seeking refuge from the heat, but they also offer laid-back and trendy hangouts with inexpensive drinks and deliciously fresh cuisine. Visit in the winter, and some towns seem nearly vacant. A few top and relaxing spots to visit, no matter the season, include Sagres, Figueira da Foz, Costa Nova, and Viana do Castelo, and these are only the beginning. Meals are enjoyed, even in the middle of the workday. A Portuguese meal commonly lasts at least an hour (including workday lunches). Rarely will someone rush away in their car with a sandwich in hand as they try to beat the clock, and the local tascas are full of workers sitting with colleagues and chatting as they consume a full meal (that may come complete with a glass of wine or beer and an espresso). Dinners are normally longer affairs that can easily last 2-3 hours. Vacation costs can add to stress, but Portugal is a budget-friendly destination. The cities are like free, open-air museums with stunning architecture in every downtown neighborhood, and plenty of actual museums ask for reasonable entrance fees (usually just a few euros). Tourists also won’t break their banks on dining out, and breakfast/lunch/dinner can be enjoyed for €3/€7-8/€12-15, respectively (drinks and dessert included in many cases). The rat race is nearly non-existent. There are certainly ambitious professionals who work hard to get ahead, but the conceptual ‘rat race’ doesn’t really exist in Portugal. The Portuguese also set aside time for weekends, vacations, and holiday breaks, and there is less of a sense to ‘keep up with the Joneses’. Generally speaking, the Portuguese work to enjoy life instead of living to work. It’s easy to beat the traffic. Highways are fairly empty in Portugal (unfortunately, in some part due to expensive toll and gas prices), but traffic also flows smoothly on rural roads. There is an exception to every rule, however, and Lisbon’s traffic (especially over the April 25 Bridge) can get thick at rush hour. Planning to cross an hour before peak times will make a huge difference, otherwise, enjoy the calm roads while road tripping. The benefits of hot springs are well known, including stress reduction and pain relief, and the Azorean Islands are a great spot to find these natural ecosystems. One of the most famous springs is in the village of Furnas in São Miguel, called the Poça de Dona Beija. The epitome of comfort food. Few things are as comforting as a dish of something warm and tasty, and Portuguese cuisine knows how to deliver. Try caldo verde in Lisbon, a francesinha in Porto, açorda in Alentejo, or any other number of culinary masterpieces. Small bars, tasca restaurants, and the city kiosks are full of people enjoying a glass of wine or beer during the day, in a completely judgment-free way. Go ahead and have that midday drink, no one cares. Portugal is growing as a wellness destination with yoga, spa, and other retreats getting scheduled across the country. Also, spa hotels offer a range of treatments (this resort in the Algarve was reviewed by CN Traveller), and the major cities are home to many different specialty centers. There’s no shortage of hiking routes. Hiking is a popular pastime, and working up a sweat while climbing the local peaks is a good way to work off stress. 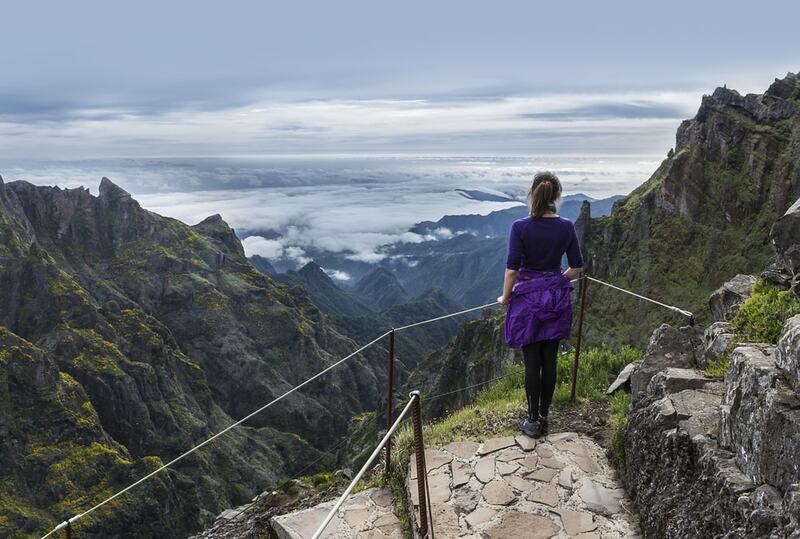 From the mountains on Madeira Island to the Serra de Estrela and Peneda-Gerês Park (and more) on the mainland, there are many opportunities throughout this small country. Over the last few years, Lisbon and the Algarve have become popular travel destinations that get hectic during the summer, but a reprieve from the crowds is a short drive away. 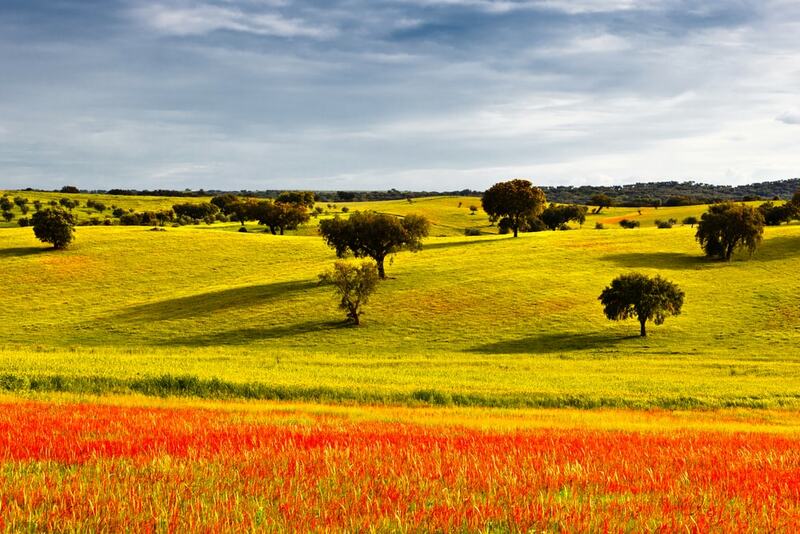 The Alentejo is still one of the country’s best-kept secrets and the country roads offer miles of fields, cork oak trees, vineyards, and cozy villages. Even Évora, the regional capital, sees fewer crowds in the summer than the nearby coastal cities. Portugal’s warm temperate climate is another major reason to visit, and the weather patterns remain fairly mild and stable. In Lisbon during the summer, temperature averages between 76-80°F (24-26°C) with a few days reaching higher towards 90°F (32°C), although that’s rare. Winters, on the other hand, rarely dip lower than 50°F (10°C), so the climate is comfortable nearly year-round. There’s plenty to see, especially outside of the tourist centers. Lisbon, Porto and the Algarve are all wonderful destinations, but Portugal has plenty more cities and towns to visit with much few crowds but equally beautiful attractions. Just a few examples are the Batalha Monastery near Leiria, Peneda-Gerês, many vineyard estates that double as hotels, and the Bussaco Palace near Coimbra. Getting to and from various points in the country by public transportation is also easy, so renting a car isn’t always necessary, and travelers can kick back with a book or enjoy the views while getting from one destination to another. Portugal is a safe destination, an especially appealing fact for single travelers and families. In 2017, it was ranked the third safest country in the world, an impressive feat that only places Portugal after New Zealand and Iceland.